Now build your muscles with free weights and benefit from free exercises. Aerobics dumbbells and barbells for training at home and at the gym. Fantastic Bit of Kit. So I have an old set of concrete / plastic type weights set and just wanted something streamlined for the bedroom. This is fantastic. Thought about it for a bit as it's a lot of money for one dumbbell but all the slot weights mean you can run up multiple sets of weights and the floor space remains constant. Turn the dial and lift the weight and half the plates stay in the holder and the rest stay on the bar. Do a session put back , turn the dial and lift it back out with say 20kg on it. Looks smart, rests on a holder on floor and a great purchase - really good. Exactly what I ordered, delivered when they said. Dumbell excellent quality and easy to use really saves on space but gives you all the variants you might need for different exercises. I have bought several items from Fitshop and they have all exceed my expectations. Equip your strength training room at home or your gym with weights. Weight training allows strength training of almost the whole body. With a weight set, you purchase weights for all training targets and each training level. Do biceps curls with higher weights as overhead exercises for the triceps. One weight already replaces a complete weight set for so-called adjustable dumbbells. These are dumbbells, where single weight elements can be put on or off by a simple locking system. In practice it means that the dumbbell lies in the rack. You adjust the desired weight on the lock mechanism and just lift the dumbbell. The weight elements, which are not required, remain in the rack. The adjustment is done by a control knob or a simple push lever. No screwing, no putting on weights - an adjustable dumbbell is already the complete weight set. Train the whole body with weights. Weight training allows maximum flexibility for doing your strength training. Furthermore, weights are an affordable alternative for many other training machines. In general, weight training offers the user the possibility to do strength training and intensively demands the muscles. Due to the fact that movements of weight training or not guided, but the whole body has to stabilize the movements on its own, additional stimulations are given which support the muscle building. Weights are not only the right choice for muscle building and strength training: with weights, you can train your strength-stamina, tighten your tissues, and achieve many other positive training effects. Buy weights - which differences are there? - Dumbbells: are often used as pairs and are of most flexible use. As both arms move independently of each other, the coordinative demand is very high - standing for an additional training effect. - Barbells: offer more stability while doing strength training, as both hands are combined with each other. The coordinative demand is lower, though several weight lifting exercises can be done with a barbell, i.e., squats, deadlift, and bench press. -Special weight types: SZ bars and triceps trainers are ideal for special training of certain muscle groups and for doing certain strength training exercises. These types of weights are useful for advanced strength athletes, because new impulses and stimulations can be set. 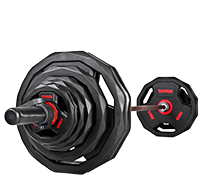 Here you find many different weights and weight sets: compilations of several compact weights, sets of dumbbells with weight stands, adjustable dumbbells, and sets of bars and weights.